I love it in cocktail sauce, but I can’t do it straight. Prepared horseradish is a condiment that I did not have during childhood, although we probably should have grown the plant because it would have cured every cold I ever got. The heady, strong smell of prepared horseradish clears your sinuses pretty quickly. Michael loves it spread on meat or as a sauce for sandwiches, but he also likes to eat really hot peppers. He rarely ever gets a cold, so I may have to give the horseradish and hot pepper preventive a try. His parents grow horseradish at their camp in the Adirondacks, and his father made a batch while we were visiting last week, so of course I had to capture his process. 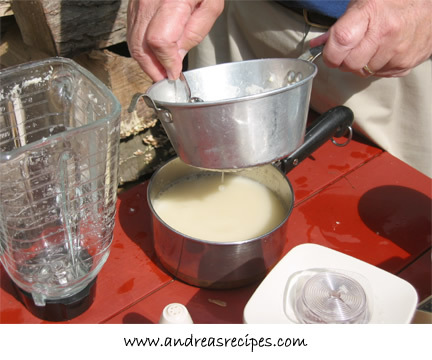 They don’t keep a food processor at the camp due to kitchen space, so they use a blender instead. Michael sampled the batch and proclaimed it “good, with a slow burn.” Michael’s uncle has a bunch of plants that grow wild on his property, and he rotates the harvest over a three year period so that the roots have time to grow back strong. Some of the roots that he has dug up are over an inch thick. Horseradish can be grown as both an annual or a perennial depending on your hardiness zone. To grow your own as a perennial, plant it and leave it alone for at least a year before digging up anytime during spring through the first frost. Then cut away the roots, leaving a small amount just below the stems, and replant the stems for next year. Harvesting just after the first frost gives maximum heat to your prepared horseradish. Making horseradish is really pretty easy, but it’s one of those jobs that’s probably best done outdoors unless you want that strong smell to hang around your house for a while. Horseradish freezes well, just put it into small containers and cover with a layer of plastic wrap before sealing. And if you are looking for ways to use it, check out Foodily.com’s list of recipes with horseradish. In response to a number of requests, I checked with the National Center for Home Food Preservation about canning horseradish at home, but they currently have not identified a safe, tested method for home canning. Their recipe for pickled horseradish sauce recommends storing in the refrigerator. 1. Dig up the horseradish. 2. 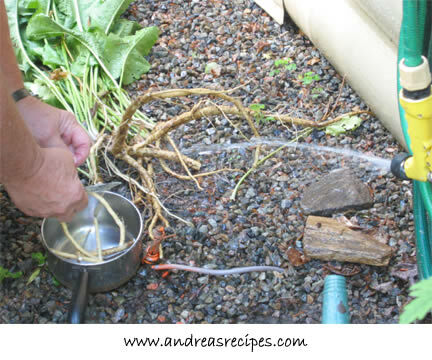 Rinse the roots and cut just below the base of the stems. Set the stems aside to replant as they will grow new roots. Scrub the roots clean and cut into 2″ pieces. 3. Pour the cider vinegar and water into the blender. Add all the cut roots. Add water to the full line and cover. 4. Blend for several minutes until the roots are finely ground. Strain the away the liquid. Store in a well-sealed plastic container. Food processor instructions: Pour the cider vinegar, 1/2 cup water, and the cut roots into the processor bowl and cover. Do not add more water. 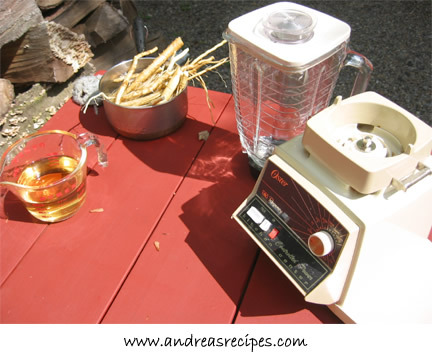 Process until the horseradish is finely ground and strain as above. Andrea, my husband loves both horseradish and apple cider vinegar, so we’ll have to give this a shot. Thanks for the recipe! You’re welcome! Michael really enjoys it, and I hope you all do, too. I have found that a pinch of salt and 1 or 2 cloves of finely diced garlic will enhance the flavor. Our prepared horseradish is sooo strong. What did we do wrong? and is there a way we can salvage the horseradish by taming it down? Freshly made horseradish IS very strong. You can add ground/pureed parsnip like some commercial brands do. You did nothing wrong. Strong is what you want. Keep in mind you are making an ingredient here. This is not horseradish sauce, it is prepared horseradish – an ingredient. Ultimately, you will mix the prepared horseradish with other ingredients to make a horseradish sauce, dressing, or dip. For a milder sauce, use a higher ratio of fatty ingredients, i.e. Butter, sour cream, mayonnaise, and/or cut back on the prepared horseradish. The stronger it is means a little will go a long way. I’ve heard of two things you can try, but be aware that I’ve never tried either one simply because my in-laws and husband like hot horseradish. Try adding more cider vinegar a little at a time. Let it sit for a while, then strain again. You can also try letting the horseradish sit out (outside) uncovered for a little while. The oils that produce the strong odor and flavor are volatile and start breaking down if exposed to air or vinegar. please i need information in regards of prepared horseradish. i have a bunch of red radishes to put in my salads. the question is: are this red radishes the ones to be use to prepare horse radish? if so,please tell me how to proceed. Red radishes are from the same botanical family as horseradish, but they are different plants. Red radishes are not used to make prepared horseradish. I tried to make horseradish, and near the top the horseradish turned purple. What did I do wrong? Tom: Well, I’ve heard of purple horseradish, but that’s made with beets, so unless you’ve added beets to your recipe, I’m stumped. I’ve asked my in-laws, the family horseradish experts, and they never heard of it turning purple on top. I’ve also searched a few cooperative extension websites in states where horseradish is produced, and I don’t see mention of prepared horseradish turning purple on top. So I’m afraid I don’t have an answer for you. If your horse raddish is to hot after putting it through the blender add a small amount of turnip slowly until you have the taste you want.always keep the seal on even when using it at the table,and keep it in the fridge. 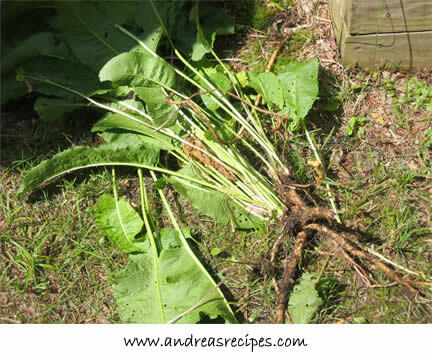 I just planted some horseradish roots this year and I was wondering if at all possible if I could use it this fall. It has gotten real big. If I do use it this year what could happen? So you can harvest it in the fall knowing that you’ll need to replant for next year. My Aunt used to add breadcrumbs and sugar to her horseradish for a milder flavor. Do you or any of your readers know the quantities of those three ingredients to use? I made horseradish last year, with cider vinegar. It was that strong,when I opened the food proccesor,I thought it was going to knock me out. That’s what I wanted, very stong, but as we used it, it got milder and milder, what did I do wrong? ALL horseradish will get milder and milder the longer it sits, the is NO preventative, you just have to make it regularly. I’ve been making horseradish for the last several years but it never is as ‘hot’ as purchased product (e.g. Silver Spring or Helluva Good). I harvest the roots in early spring (in time for Easter). Do you think the time of the year the root is harvested impacts the strength of the horseradish? Hi Nola. Our family doesn’t add sugar and breadcrumbs, but I did find a recipe for you on Cooks.com that uses 2 ounces confectioners sugar, and 4 ounces of breadcrumbs, as well as a pinch of sea salt and 1-1/2 cups of light cream. Thomas, I can’t say that you did anything wrong. Horseradish naturally loses potency over time. Also, it loses potency when exposed to heat, so if you plan to use it in cooking and want maximum heat, add it later in the cooking process. John, according to an article I found on DIY, harvesting horseradish after the first frost gives the hottest flavor. My name is Mark and enjoy very much using horse radish with food. After seeing the way is prepared, my question to you is: What do you do with the left over liquid after blending the roots? I have reasons to believe that the liquid might some important medicinal property. Did it ever cross your mind to find out the usefulness of the liquid? Hi Mark. I’m no expert on medicinal uses of botanical ingredients, so I’m afraid I can’t help you with that. Hi Steve. As far as I know, you should replant the roots promptly. I’ve had horseradish in my garden for a number of years, and enjoy it on a regular basis. I haven’t had any issues with it becoming woody over the years, but what I was curious of that I didnt see in your prep. instructions is do you remove the ‘outer casing’ from the root or do you process everything as pictured ? and you say ‘”Strain the away the liquid. Store in a well-sealed plastic container.” are you storing the liquid or the processed root? Hello…I read someplace that horseradish becomes woody and not culinarily useful when the plants get older. I just found some large abandoned plants and made a batch and it seems fine. Are older plants ok to use? How would I tell if a plant is woody and not useable? should I cover what I just made with white vinegar and strain if off when I use the horseradish? Thanks for your help. I have made horseradish many times and last year was the first that I was satisfied with. I do not remember where I saw this wat but we enjoyed. It was not hot enough and did not stay hot. I cleaned it and ground it in blender. Then let it set 5 min or 7 then put vinegar in it. I have just been given some fresh root, how do I prepair it? I’ve never made it before…”HELP” please…. Hi Donald! I sent you an email. If you follow the directions above, you should be fine. Hi Veronica. Horseradish keeps in the refrigerator for about 6 months, and longer in the freezer. I’ve never canned it, not did I see any mention of it in The Complete Book of Home Canning. I did find a site that mentions boiling the vinegar, pouring over the root leaving about 1/2-inch of head space in the jars, then processing using the boiling water method; however, I cannot verify if this is safe or not. Responding to #18, a question from Mark asking about the medicinal properties of horseradish root. 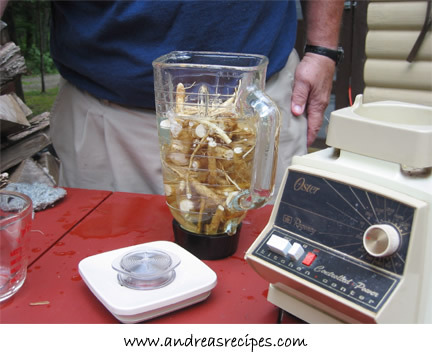 It will clear your sinuses immediately and probably improves circulation.l There is available, probably on DR. Schultz wedsite, a recipe for Master tonic. It is composed of horseradish root, ginger root, garlic, white onion and habanero peppers. It is strong, and effective when a cold starts or just before. His, (Dr.Schultz) website should have details, If you cannot find any on the website I will be happy to share my copy of the medicinal properties of this product for the cost of copying and mailing. email me at the above address is you cannot get this info on Dr. S website and still want it. Great stuff!!! can you add milk to make it white? can you freeze in jars? Blend the prepared horseradish with a little sour cream just before using. Hi Joyce. Yes, you can freeze it in jars, and though I’ve never heard of adding milk to prepared horseradish, many white sauces made with horseradish have milk or cream. I make horseradish every year from my garden. For reeasns too long t explain I was unable to put my fresh made horseradish into jars and used plastic containers. Is there any problem with this? Hi Rick. No problem with storing in plastic, but they’ll probably absorb the flavor of the horseradish, so it will be a one time use. I just pulled up some horseradish that has been growing for three years. When I processed it in the blender it didn’t emulsify as small as I wanted. Did I wait too long before harvesting it. It seems a little woody to me. Is there any way to break it down further? Hi; Grew roots this past summer, dug em around Thanksgiving. Cooked fresh beets Today (Fri. 12/12). Will grind Sat. (12/13). I’ll be making a batch of white (Chrzan). and a batch of red (cwikla). I will use a modified recipe. I’m trying for maximum heat. Let you know how it turns out. P.S. been doing hot peppers for many years, so there should be no prep problems. Already made most of the mistakes. You can find nice fresh Horseradish roots and Corms on Ebay. Thanks for the horseradish recipe. It seems every time I go to walmart or any place else they are always out of it. My son and I both make our own shrimp sauce and there is nothing better than using fresh horseradish. Thanks again! I didn’t realize it was so easy. Hi Michele. Prepared horseradish is very strong and naturally bitter—it’s a bitter herb for the Jewish Passover Seder—so I’m not sure if you mean more bitter than usual. The quality of the roots can vary depending on a variety of factors, so roots from some locations may be stronger than others. I have been growing my horseradish patch for 3 years now, in Colorado where it should die back in the winter. I dig/pull what I’m ready to process, when I’m ready for more (any time of year that the ground is not frozen). Wash and peal the brown bark leaving bright white roots. I try to keep at at least 1/2 inch diameter. Shred with “Microplane Fine Grater” by hand, into a work bowl. When a ‘pile’ of shavings is ready, or you are crying too much to continue, add a tablespoon full of water and stir with a fork. Continue one tablespoon full of water at a time until the mass begins to stick together. Remember the number of tablespoons of water you add. Let it sit for about 5 minutes while getting ready to work on the next batch, then using 1/2 the number of water tablespoonfuls, add white cider vinegar. Stir with fork until uniform consistency, and pack into your ‘horseradish’ container in the fridge. You can store cleaned, whole roots in the freezer in ‘zip-lock’ bags. I’ve had some as long as a year. Then grate what you need for the next event. 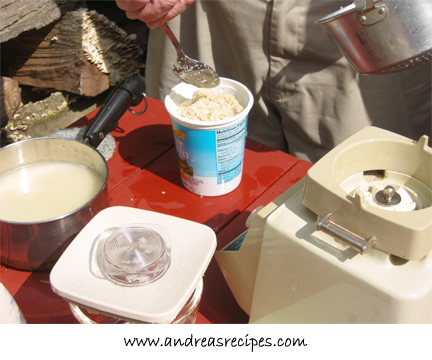 Hi Andrea …..I use a meat grinder with fine screens and grind into a plastic bag that I have sealed over the end of the grinder. This keeps the loss of all the good vapours from the oil to a minimum. I store the finished product in baby food jars in the freezer and use it directly from there. It never really freezes rock hard and by the time it sits on the plate for just a minute or so it’s great to eat. Why can’t horseradish sauce be canned? You can buy it in the grocery markets and it is certainly sealed in jars. I have a hugh area of horseradis had comes up every year and is very prolific. I may ecperiment wit some of it to see what I can do. Been growing horseradish since I discovered it growing in the garden at a house me and my wife bought. Been trying to get it to keep after harvesting it every year and think the best way is to freeze the cleaned root whole. Store bought prepared horseradish is pasturized and sealed to preserve. Thanks for sharing your knowledge and recipe, Andrea. I prepared the horseradish in a jiff right before corned beef dinner with in-laws. Wow, the fumes were strong!!! I eyeballed the vinegar and water. Also added some Worcestershire and garlic! It turned fantastic. Could have added some fresh lemon juice, but this time sprinkled some citric acid, so it keeps for a long time. It is delicious, but have to caution people because it is sooooooo strong! Is there a canning process for horseradish. Seems like you should be able to hot water process it for extended storage rather than always keeping it in the fridge. Just wondering as I haven’t found anything on this. Hi Julie. I always research canning questions at The National Center for Home Food Preservation. Your question actually comes up a lot, and I checked their website again today to see if they have changed the information about canning horseradish, but they still say to refrigerate. I can’t believe you can’t can it. I wonder why. What could possibly be the reason? The vinegar should keep it from going bad one would think. Here’s a thought which I am going to apply to this years horseradish crop. I read about it several years ago for varous herbs, and it works well; hope it’s the same with horseradish. Get one or two plastic ice cube trays (after horseradish, you may want to dispose of them!) and use them to freeze the prepared horseradish (or in the case of other herbs, finely chop them, or run them through a food processor) into the trays and freeze overnight. Pop out the “herbcubes” or horseradish cubes and put them into those cool “vaccum seal” ziplock top freezer bags, and use the little hand vaccum to remove the air – and through them in the freezer. When preparing dishes calling for fresh (herbs) – pull out a couple basil, peppermint, horseradish….. you get the idea, and toss them into the pot or pan. The water from the cube will disappear as steam leaving nearly fresh herb flavor in the dish. I’ll let you know how it goes with the horsseradish!